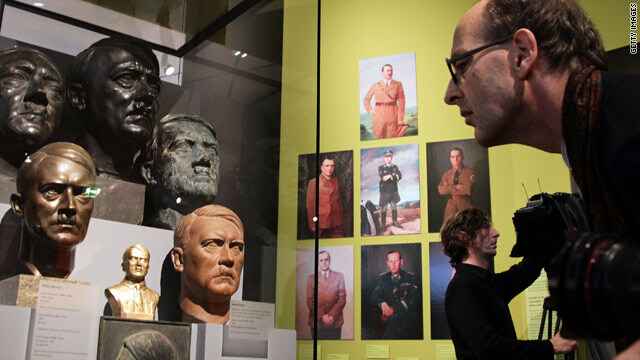 A visitor looks at busts of Adolf Hitler in the "Hitler and the Germans" exhibit at the German Historical Museum. (CNN) -- Playing cards with images of Hitler. Toy fuhrers. And a lamp and church tapestry with swastikas emblazoned across the front. No, it's not a neo-Nazi convention. Rather, it is a groundbreaking exhibit that opened Friday in the German capital and is intended to show Adolf Hitler's relationship with the German people. Germany has produced exhibits on the Holocaust and Nazism before but never since World War II has one focused solely on the man who taught an entire nation to hate. "Hitler and the Germans" is not about the fascist dictator's memorabilia, not about the man himself, said curator Hans-Ulrech Thamer. It's not about textbook history or scholarly writings. The everyday objects on display show how Hitler won the heart of the German people. Everyone can read a book, but "objects have another quality," Thamer said. There are rows and rows of magazine covers carrying the face of Hitler as well as enormous metal busts carved for industrial mantle pieces. And propaganda signs, welfare collection boxes, photographs, film footage promoting a visionary leader of the fatherland. Thamer hopes viewers -- many of whom are sure to be Germans who no longer have direct memories of their nation's ugly history -- will look inside themselves as they cast their eyes on ordinary things that back then, served a very extraordinary purpose. Michael Salberg of the Jewish civil rights group the Anti-Defamation League, called the exhibit "extraordinary." "It's the ordinary objects -- that is what makes it powerful," he said. They are disquieting, upsetting, even off-putting, he said. Viewers might even go home and turn on a lamp in their living rooms and think about how the objects in the exhibit once occupied the same kinds of places. "It wasn't just among a group of elites," said said Salberg, director of international affairs at the ADL. "That German society was permeated with the symbols and the images that the regime was promoting was an important first step, and it took hold in a very frightening way." More than 1,000 people streamed into the museum on opening day, Thamer said. They walked through halls devoted to three chronologically and thematically arranged chapters showing the circumstances of Hitler's rise and rule. Swastikas are banned in Germany but Thamer said museums have special permission to display them for historical purposes. Still, organizers of the show agonized over possible repercussions: inciting neo-Nazi extremists and infuriating the rest of the world. A new study published this week in the German magazine Der Spiegel revealed far-right thoughts are common in Germany today. One-third of Germans said they would send foreigners home if there were not enough jobs to go around. One-sixth of Germans said Jews have too much influence. "Yes, we have had some objections," Thamer said. "One of the fears discussed in the newspapers is that this might promote extreme groups. But I am not sure they enter museums." Salberg said he did not believe an exhibit was likely to accelerate or motivate extreme viewpoints. "People who have a xenophobic view of their society are not going to be any less or more xenophobic because of this exhibit," Salberg said. Deborah Lipstadt, a scholar of the Holocaust, also felt such exhibits are important. "You understand that these things did not come out of nothing," said Lipstadt, who teaches at Emory University in Atlanta, Georgia. "There was a method to the madness." She found powerful a similar exhibition of the power of Nazi propaganda at the United States Holocaust Memorial Museum in Washington. Some 55 million people died in World War II, including 6 million Jews who perished in the Nazi-orchestrated Holocaust.